Windows 8 user interface is totally different from Microsoft Vista or Windows 7. So everything is difficult up to time you get used to the new Windows 8 features including the new Windows Start screen hosting app tiles and new Windows Desktop without the support of classic Windows menu. Since I'm keen on to learn the new UI with multitouch support of Windows 8 operating system, I enjoy spending time for learning tricks of the Windows 8. Also I'm experienced on using new operating system of Microsoft Windows 8. I've downloaded and installed Windows 8 versions Developer Preview and Consumer Preview, so I've some solid hands-on experience on using Windows 8. But my daughter and my wife don't have this experience. After I install Windows 8 download of RTM version which is the final release of Windows 8 available for public use, I observed they had difficulty adapting to new Windows 8 features and functionality. So I thought it will be nice to share our adventure with Windows 8 here. Incredible! Windows 8 is very fast when compared with my previous Windows 7 installation at my home PC. I am surprised with how Windows 8 an boot in that short time. Maybe because nothing is installed on Windows 8 computer yet. Boot speed is very important for me, because I have to wait more than 10 minutes at my office for my Windows 7 computer. I can understand it too. First of all enterprise rules. Second roaming profile over intranet over countries. Third, more than 3 versions of SQL Server database is running besides Oracle and MiniSAP, and other numerous software. I afraid after I install SQL Server and other applications, Windows 8 will boot slower! I will test it and write here. Using Internet Explorer 10, we looked for a map of Turkey using Bing Image search and wanted to print it for school. I just plugged in our Canon printer for the first time. Without installing printer or dealing with any Windows 8 user interface for setting or configuring new printer to computer, I directly pressed Print button. And the map image is directly printed. Nice! Real plug and play support. I just wanted to play music on my brand new operating system Windows 8 on my PC. OK, I browsed my Seagate external disc and double click on an .mp3 file, a new user interface for playing music. Probably Music app is a new music player for Windows 8. I played around with controls to get used to it. But I could not adjust volume within music app. I had to adjust volume using Windows 8 volume control which affect all sounds on my computer. Unfortunately I still could not find how to control music app volume seperately among other Windows 8 applications. I experienced a postback button problem on my ASP.NET web site during login. It is interesting that a similar problem had been occured years ago with .NET Framework 2.0 Any how if you experience a login button does not behave as expected or simply does not work, this is because the web application can not recognize your Internet Explorer 10 IE10 as a known browser agent. 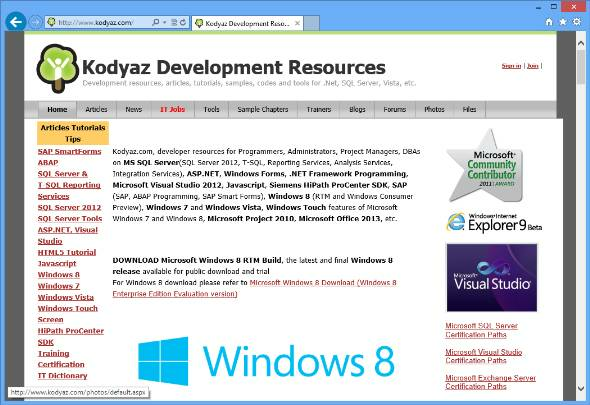 Thanks to Microsoft that they had created a hotfix which can be downloaded free from Knowledge Base support site. After this hotfix is implemented on the web server, the problem with button postback will be resolved. While searching for the IE10 and ASP.NET web sites postback problem, I experienced that Bing failed to list web sites referencing the knowledge base article. On the other hand, Google was successful with returning a list of referencing web sites to KB article. I think I'll add Google search provider to Internet Explorer (IE10) and configure it as default search provider. Let me try with Yandex next time to compare it with Google. Adjusting Windows 8 Music app volume seperately from other apps is still a problem. I used Windows 8 search charm and check for new updates to Windows system using "check updates" phrase. You can also use "update history" to display installed system and program updates. I realized that the installation mode of updates was set as auto update mode by default. So whenever a new update is released by Microsoft, if you're online your PC will automatically download and install these updates. I had to reboot Windows 8 in order to complete system updates. Although a signaficant time passed with configuration of updates, the time spent for Windows 8 restart was quite short. I think the new lovely default login screen is the fastest Windows login screen I have ever seen.